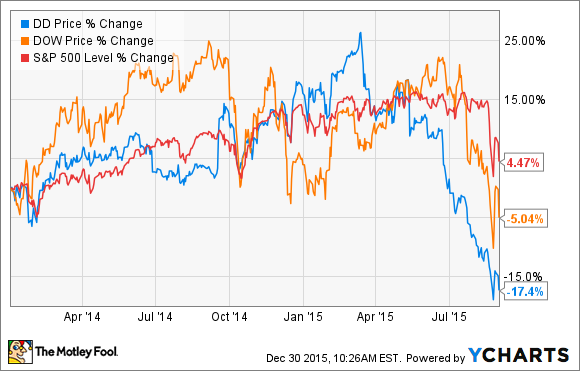 The DuPont-Dow Chemical Merger: A Lot of Hype or a Long-Term Opportunity? The two companies plan to merge and then split into three separate entities. Is there any way to tell how this will shake out? Ring the wedding bells: DuPont (NYSE: DD) and Dow Chemical (NYSE: DOW) are becoming one! The two largest chemical companies in the country by market cap announced their merger on Dec. 11, creating the unimaginatively named DowDuPont. But DowDuPont isn't going to be around for long. In less than two years, it will break into three separate public companies (which I really hope are going to be named Dow, Du, and Pont). But whatever their names, they will each specialize in one area of the industry: agriculture, material science, and specialty products. But will they specialize in creating value for their shareholders? Last year was especially rough for DuPont. In May, activist shareholder Trian Partners launched an unsuccessful proxy fight to gain board seats. In July, the company cut its dividend and lowered its end-of-year projections. In October, CEO Ellen Kullman abruptly resigned just days before the company reported EPS that was just one-third of the prior year's. Dow has had an easier time of it but still reported lower YOY sales in both the second and third quarters. Dow has also had issues with an activist investor, Dan Loeb of Third Point. Both companies clearly could use a shot in the arm and think this merger is just what the doctor ordered. In the press release announcing the merger, the companies said this was the culmination of a long-term goal to merge. And indeed, these companies have a history of working together. Most recently, they launched joint venture DuPont-Dow Elastomers, which was active from 1996 to 2005, and sold products such as synthetic rubbers neoprene and Viton. (Full disclosure: My mother worked for this joint company for many years.) In less savory news, both companies were also parties -- along with Bayer and others -- to a long-term price-fixing conspiracy that was uncovered in 2005. So the seeds of cooperation have been in place for quite some time. The cost savings the companies would achieve through this merger are considerable. By combining operations, they plan to cut some $3 billion in annual costs. Sadly for my hometown of Wilmington, Del. -- DuPont's longtime HQ -- this will translate into massive job losses. DuPont just announced the cutting of 1,700 jobs -- about 28% of its Delaware workforce -- with more almost certainly on the way at both companies. DowDuPont will have strong market share in the areas in which it operates. While its combined $51 billion materials business will still be smaller than German chemical titan BASF's, it will be a strong second in the industry. Its $19 billion agricultural chemicals business will become the world's largest. And its portfolio of specialty products -- including bulletproof Kevlar and construction wrap Tyvek -- will remain large and diverse. So the merger seems logical, and indeed, shares of both companies jumped 12% following its announcement. But remember, DowDuPont is going to be around for less than two years -- if it even gets created in the first place. So, maybe hold off on those wedding bells, because nothing about this merger is set in stone. U.S. and European regulators could demand fundamental changes to the structure or portfolio of the new company, or they could simply veto the merger outright. Antitrust experts interviewed by Reuters expressed skepticism that the deal would be allowed to proceed as planned. "That strikes me as a just plain no," said Professor Peter Carstensen of the University of Wisconsin Law School, who teaches antitrust law. Certainly, U.S. regulators have scuttled several recent proposed mergers and acquisitions on antitrust grounds, including the sale of General Electric's appliance unit to Sweden's Electrolux, the purchase of Office Depot by Staples, and the merger of Time Warner and Comcast. Shareholders could also force changes to the deal. Equally unclear is how shares in the new companies would be distributed, but assuming that the deal proceeds roughly as planned, the end result might or might not work out for shareholders. In a best-case scenario, each of the three new companies will be more streamlined and focused, leading to higher margins. Each will also command a larger market share, increasing its pricing power. Finally, each would use its improved financial position to fund innovation that would spur growth and keep the companies competitive -- and profitable -- into the future. But this rosy future is far from guaranteed. Several analysts -- including Fortune editor Alan Murray, Forbes contributor Adam Hartung, and John Cassidy of The New Yorker -- foresee a far bleaker scenario. Prompted by activist investors and Wall Street corporate engineers, R&D costs -- especially at DuPont's famed research division -- could be slashed, along with critical capacity and personnel in finance, marketing, and sales, leaving the three new companies unable to grow or compete with larger rivals such as BASF and Bayer. "Unless you are an investment banker, it's hard to feel good about the deal," wrote Murray. There are simply too many unresolved questions about this deal -- which may not even be allowed to go forward -- to call it a win or a loss for shareholders. Here at the Fool, we take a long-term view. That means looking beyond the potential short-term gains and cost savings of a Dow-DuPont merger and instead examining the prospects of the three companies that would come out the other side. And those prospects are unclear -- so unclear that buying or selling Dow or DuPont on this news would be nothing more than a crap shoot.